Hello everyone, I hope you’re having a successful start to 2016 so far! Recently I applied to become an ambassador for the CIPD Steps Ahead mentoring programme and I am so proud to say that I was successful! I am so happy at this achievement I could actually burst, so what better time to talk celebrating your achievements than now? Perfect timing springs to mind! My aim as ambassador is to get as many people involved in the scheme as possible both mentors and mentees so I am speaking with a lot of contacts in the press to try and get some increased coverage so watch this space! When we sit down and set our goals, we always keep the focus on the end result, that is what helps us achieve them, but when you get there, you simply cannot beat that feeling. The goal doesn’t have to be huge, it can be something small but it is what it means to you that is the key thing. One of my biggest achievements was being a finalist at the 2012 CIPD awards when I was nominated for the Michael Kelly Student of the year award. I was a highly commended runner up at the event and the only person who didn’t win an award who was mentioned in the winners book which is great as I made some wonderful contacts as a result. I had a great support network around me too, my CEO at Circle Express nominated me for the award and my tutors at Acacia Learning were over the moon at having a student nominated so it just goes to show if you push hard enough, anything is possible. I have achieved so much in my career and all working from scratch from the bottom up so when people say they can’t do something, I am living proof that you can! Thank you for all your pictures of your post it notes over the past few weeks, I’d love to see more of your goals and ambitions on your post it notes, and if you need any advice from me, feel free to use my contact details in the contact tab. 2016 is our year so let’s get those goals set and shoot for the moon! Is HR really out of touch? In January’s issue of People Management it was revealed that only 48% of employees knew who HR was and that they had not seen anyone from the function in over 12 months. I took to Twitter and spoke to many what seemed to be many disgruntled employees, it caused quite a debate! They could not see the purpose of the department or had encountered their HR Manager in not just weeks or months, but YEARS! Some even compared HR to “being on the same level as estate agents” calling them confusing as there are no clear divisions of service. This begs the question, has HR lost touch with its workforce? HR professionals also voiced discomfort at the findings, stating that the very reason they are part of the profession is to support employees as well at the business, they agreed that more needed to be done to improve relationships and indeed their reputation within their businesses. I 100% agree, it is up to us as HR professionals to get out from behind the desk and get in touch with our people. Since the publication came to light, I myself have made some changes in my diary and also make a point of going around the building and speaking to my colleagues, it is important for HR to be visible as otherwise you’ll end up fading into the beige walls, adding zero value and losing touch with employees. Is it acceptable that HR are seen as simply too busy with meetings, administrative duties and other commitments that they have forgotten those who they are employed to support? I personally do not think it is and I don’t believe it is the case overall. Many issues can be resolved simply by sitting down with line managers and supporting their requirements to effectively manage their employees. I also think that HR should speak directly to employees to gain a further understanding of company culture and what they need to keep them happy at work (and no, money isn’t always the answer!). A survey cannot replace a relationship, I don’t believe they are effective and I also don’t believe they provide the honest answers needed in these types of situations. Have an open door policy; going into HR is daunting enough without the locked doors and secret squirrel approach, we’re not MI5! Open the doors and make employees feel welcome! Get out there! If you have regional sites, schedule some visits and learn about the employees, we recently had our Managing Director go out on a back to the floor style exercise and went out with one of our delivery agents, they get to see what it is really like! Only we can create a positive impression of our profession, go out there, speak to your people and be a different story from those within the PM survey. A huge thank you to those who contributed to my blog post by giving me their views on this controversial topic, by speaking to you I am able to understand the perspectives of others to hopefully inspire HR departments and employees to work together to make improvements. It is up to all of us as we share the responsibilities of our working environments after all. First of all I have some news to share, I have applied to become a Steps Ahead Ambassador! I am so passionate about this programme (not that you don’t know this already!) and feel that the ability to take this on further both nationally and locally would be such an amazing achievement so do keep your fingers crossed for me! As I continue to mentor through the Steps Ahead programme, I have uncovered so many things that HR can offer to young job seekers. By highlighting these key points, I hope that other professionals reading this will consider taking some time out of their busy schedules to help a young person into employment. 1. Experience – Let’s face it, we face so many different situations and know exactly how to handle them! We know exactly what perspective employers are looking for when it comes to recruiting, sometimes all it takes is a reshuffled CV, interview advice and a bit of encouragement. HR professionals generally love their profession so why not show off the skills we studied and work so hard for? 2. Connections – Most HR professionals network. We have access to hundreds of contacts via Linked In, recruitment agencies, CIPD branch events, networking groups and in our workplaces. By utilizing these contacts we expand our own networks to provide opportunity to the mentees, it really is as simple as that! 3. Knowledge – We have expert insight into industry trends and commercial knowledge that will assist the young job seekers to ensure they are clear about the companies that they would like to approach as a perspective employer. This also reduces the risk of them just applying for “any old job” causing them to be unhappy as well as wasting both the mentee and employers time. 4. Professional behaviors – we know the basics! We know how you should present yourself at interviews and how to draw out experience into something anyone could work with. The difference between school/university life is very different from the working world and can be a culture shock but these are things that mentors can underpin by having this understanding. Once again thank you for reading my blog, I am over the moon at the feedback and responses I receive! Please feel free to comment, suggest future posts or share with your connections. As many of you already know I’m a huge fan of tv show The Apprentice, with us all getting into the swing of 2016, now is a fantastic opportunity to talk all things apprentice! Recently on of my site managers advised me that they wanted to double the amount of apprentices that we have throughout the business from our existing eight. As you can imagine, I was overjoyed to hear this, given that investing in tomorrow’s talent is something I champion! There are a whole host of benefits to recruiting apprentices into your business and every need is different so the reasons for our approach with apprentices is to bridge the skills gap that we will have in future years. Having a loyal workforce (some of which are celebrating 40 years in their roles this year!) we would lose a substantial amount of knowledge along with their skills if they were to leave the business and with them being in specialised roles, it is important that they pass on their knowledge to future employees so that there is a smooth transition when they leave. Apprentices are not just for larger businesses but they also build smaller businesses. There are options to gain a grant through the government and they learn whilst they are in their role with their company. The combination of work and education is invaluable experience for the apprentice and whilst working alongside experienced professionals, they are able to identify the differences between school and the working environment, these are skills that they learn from the people they work for, this is something that education cannot teach them so it is up to us as professionals to encourage more businesses to hire apprentices. Big corporate schemes or small businesses hiring an apprentice all helps to invest in future talent and who knows, you could be hiring the next Alan Sugar or Michelle Mone! 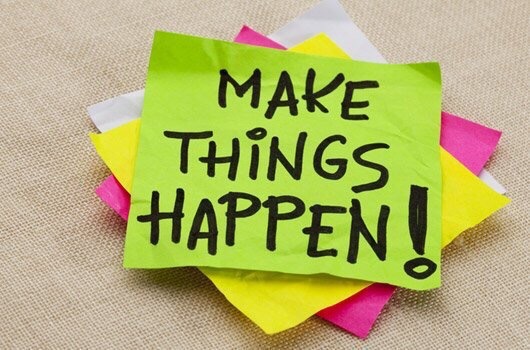 Make 2016 your most successful year yet! Grab a diary or even a whiteboard (if you are a visual like me!) and write them down, by simply having them written down can increase your motivation, think of them as pinning them to the paper so you have a firm grip on them and remain focused. When you set the goals be realistic, break the actions into smaller pieces to work through one step at a time and most of all be patient, Rome wasn’t built in a day! This is one of the most important things to keep ahead of the goals is to believe you can do it, if you don’t you’ll be disappointed and are less likely to achieve the goals you set out. Confidence is key and by believing you can do it, you may just surprise yourself! Post it notes are fantastic, make them your new best friend!! Write out the smaller pieces of your goals on to post it notes and place one to achieve each day, put it somewhere familiar to you – mine actually go by my kettle on a mug as it’s the first place I go to in the morning (I am a self-confessed tea junkie!) that way you’ll remind yourself of that step that needs to be achieved. Let’s see those post it notes – send me your pictures of your post it’s and I’ll put them up on the blog! Let’s go for it together and make 2016 our most successful year yet!